These views are only modestly changed from July 2014. The share sympathizing more with Israel is little changed, while the share sympathizing more with the Palestinians has ticked up from 14% then to 19% today. The partisan gap remains wide. Three-quarters of Republicans (75%) say they sympathize more with Israel (just 7% say they sympathize more with the Palestinians). 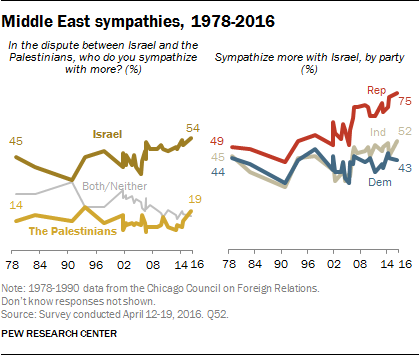 And though a larger share of Democrats sympathize more with Israel than with the Palestinians, that margin is much narrower (43% vs. 29%). By 52% to 19%, independents express more sympathy for Israel than the Palestinians. While independents are more likely to express sympathy toward Israel by a 52% to 19% margin, there is a large difference between those who lean toward the Democratic Party and those who lean toward the GOP. Republican leaners sympathize more with Israel by an overwhelming margin (72% vs.9%), in line with the views of Republican identifiers. The sympathies of Democratic leaners, however, are divided: 34% say they sympathize more with Israel and 33% say the Palestinians, while another third either volunteer that they sympathize with both (3%) or neither (16%), or do not offer an opinion (13%). Democratic leaners are less likely than Democratic identifiers to sympathize with Israel. There is also a wide ideological difference within the Democratic Party. By more than two-to-one (53% vs. 19%) conservative and moderate Democrats sympathize more with Israel. Liberal Democrats, on the other hand, are statistically divided in their views: 33% sympathize more with Israel and 40% sympathize more with the Palestinians. Among Republicans, an overwhelming majority of conservative Republicans (79%) sympathize more with Israel, as do a slightly narrower majority of moderate and liberal Republicans (65%). Notably, there are no differences in views by candidate support among GOP voters. By contrast, while Clinton supporters, on balance, are more likely to sympathize with Israel (47% vs. 27%), Sanders supporters are divided (33% sympathize more with Israel, 39% sympathize more with Palestinians). Over the past decade, the share of Americans saying they sympathize more with Israel has grown among most ideological groups – with the exception of liberal Democrats. Today 33% of liberal Democrats say they sympathize more with Israel, a share that is little changed over the last 10 years. At the same time, the share of liberal Democrats who say they sympathize more with the Palestinians is now higher than it has been at any point in the last 15 years (40%), due in part to somewhat fewer liberal Democrats volunteering that they sympathize equally with both sides, or neither side, or that they do not know. Conservative and moderate Democrats, by contrast, express more sympathy toward Israel (53%) than the Palestinians (19%) today. And the balance of opinion among conservative and moderate Democrats is little changed over the last decade. 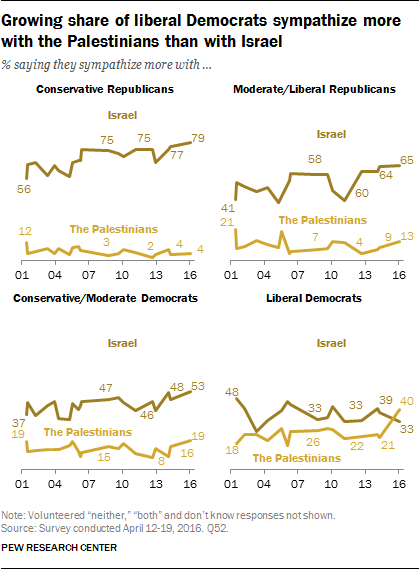 Both moderate and liberal Republicans and conservatives in the party have become more sympathetic to Israel over the last 10 years. There also are generational differences in sympathies in the Israeli-Palestinian conflict. Older generations tend to be more sympathetic toward Israel than younger generations. Currently, 43% of Millennials report sympathizing more with Israel, while 27% are more sympathetic to the Palestinians. The share sympathizing with the Palestinians has risen significantly in recent years, from 9% in 2006 to 20% in July 2014 to 27% today. The share sympathizing with Israel is little changed over this period. Among older generations, the balance of opinion is little changed over the course of the decade. Baby Boomers and those in the Silent generation sympathize more with Israel by about four-to-one. Generation Xers are somewhat less sympathetic toward Israel than older generations; still, by roughly three-to-one (54% vs. 17%), they say they sympathize more with Israel than the Palestinians. Can Israel and an independent Palestinian state peacefully coexist? By a 50% to 42% margin, more Americans say that there is a way for Israel and an independent Palestinian state to coexist peacefully than say that there is not. More now say a two-state solution is possible than said this in August 2014 (43%) shortly after the end of weeks of hostilities between Israel and Hamas. Younger adults are the most likely to say a peaceful two-state solution is possible: 60% of those under 30 say this. Older adults are more skeptical than younger people; nearly half of those ages 65 and older (49%) say a two-state solution is not possible. There also are partisan differences on this issue. Conservative Republicans are the most doubtful about the viability of an independent Palestinian state peacefully coexisting with Israel; 60% say it is not possible to find such a solution. On the other end of the ideological spectrum, two-thirds of liberal Democrats (67%) say a peaceful two-state solution is possible. There are modest educational and racial differences. More-educated Americans are more likely to say the two states could coexist peacefully, while less-educated Americans are divided. And white Americans are divided while majorities of blacks and Hispanics say an independent Palestinian state could peacefully exist alongside Israel. Overall, more now say a two state solution is possible than said this in 2014. Democrats, in particular, are more likely now to say that a way can be found for two states to coexist than they were two years ago: Today 61% say there is a way for an independent Palestinian state to coexist peacefully with Israel, up from 49% in August 2014. 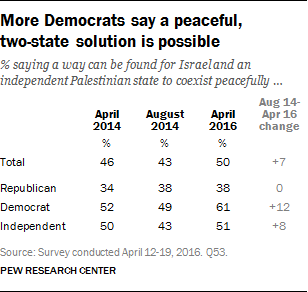 But Republican views are little changed from two years ago: 38% now say Israel and an independent Palestinian state could peacefully coexist, identical to the share saying this in 2014. About half of independents (51%) see a two-state solution as possible, up from 43% in August 2014, but little different than in April 2014.